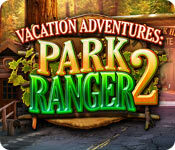 Vacation Adventures: Park Ranger 2 is rated 3.9 out of 5 by 43. Rated 5 out of 5 by zack_eckley from Good game Really enjoyed playing the game so much fun, I would have liked to see more challenges as the game seemed a little short. Rated 5 out of 5 by 704cws123 from Love these vacation games There is a frog at the hazard house I have not been able to find after several years of owning & playing game. It's about to drive me crazy. Keep these games coming. Rated 5 out of 5 by upsysydaisy from Love Nature and Parks I love these wonderful Vacation Adventures games. I own all of them and have played 3 so far. They are so educational for children AND adults. The hidden objects are quite challenging because of them being small and very well hidden. Love the extras: recycling items and hidden animals. The characters are not animated cartoonish figures. Love everything about Park Ranger...I bet you will love this series, too. A nice, relaxing escape from all the serious, darkly themed games that we are bombarded with so often! Rated 5 out of 5 by iou001 from Where was it? 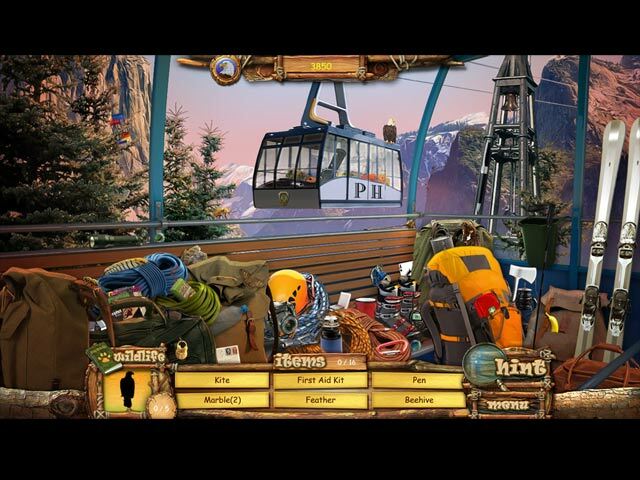 I don't know about these Vacation Adventures: Park Ranger games. They have great story lines, great graphics, etc. but I swear that they sneak hidden objects into the screen after I've hunted for them for 5 minutes. First it wasn't in the spot I looked, then it was. I know it's just me but it really gets my gander sometimes that I can miss something that's right in front of me. I love this game. Please don't quit making sequels. Rated 5 out of 5 by heartitraces from I LOVE Park Ranger!! This is another great Park Ranger game. I love the graphics and the relaxing style of this game. When I play games I just want to kick back and unwind. This game takes me away into a lovely forest adventure. Hope they keep going with this series!! Rated 5 out of 5 by ladycholla from Good overall Enjoyed this 2nd in the Casual Arts games about Pinecreek, again another to replay. Fun, clean and just enough challenge to want to replay. Rated 5 out of 5 by ST33L from Great Game After playing this game, where's No 3? Rated 5 out of 5 by arnold1049 from EYE CANDY This is a visually satisfying game. The graphics of the park locations are clear and bright and make you feel like you are right there in the scene. There are a lot of locations and you never revisit a single one, so there is no repetition. This is also a very educational game. In each scene, you collect various animals, birds and insects that go into an album. Opening the album shows you the item you have collected along with it's name. There are over 100 items to collect. In addition, you have to clean up each scene by finding the trash that has been left behind. Doing this helps you win the gold star for the scene. Then there is the HO part of the scene. Though not extremely hard, there were some items that required me to use a hint. The hint button does not help with the animals/insects or the trash. In order to win a gold star, you have to find all the animals/insects and all the trash in each scene. If you fail, you can replay the scene as often as necessary until you find everything. The hardest for me was finding all the trash. I believe I had to replay maybe 3 scenes to accomplish this. Unlike the animals/insects, you have no idea how many pieces of trash you are looking for, as the number varies from scene to scene. The minigames in between the scenes were interesting and some were a little challenging. The types of puzzles did repeat, but they were a welcome respite from the HOS. There are also achievements to be won, all of them attainable, although I was unable to finish a minigame in under 1 minute or the game in under 3 hours, meaning this is a nice, long game. The storyline is not much more than a little dialog to give a reason for moving to another scene, but it was not annoying and fit well into the game. I love all the Vacation Adventures games because of the variety in the HOS and the eye candy provided by the graphics. I'm looking forward to some new releases, hopefully soon. Rated 5 out of 5 by tutortime from Great Game ! Just like VA Park Ranger 1 but more scenes ! Rated 5 out of 5 by kassi3 from IS A GOOD GAME THIS IS A GOOD GAME, THE SCENERY IS GREAT, COLOR, TRYING TO FIND ALL HIDDEN OBJECTS, IS SOMETHING. THE ONLY THING I DID NOT LIKE WAS THE CRASHES AND FREEZES. WHEN I WOULD START A PUZZLE, IT WOULD FREEZE UP, THEN I COULD NOT FINISH IT. HAD THAT ALL THE WAY THROUGH THE GAME. SOMETIMES I HAD A VERY HARD TIME, TRYING TO GET THE SKIP BUTTON TO WORK. BUT OTHERWISE A VERY NICE GREAT.